Are you an Enterprise Steps client? Do you have a success story you'd like to share? Share it with us here. An urge to work in the music community coupled with an encyclopedic record knowledge was enough for husband and wife team Janet and Kieran Smyth to review their careers in television to open vinyl record store and coffee shop ‘Let It Roll’ in May 2018. Janet (a not so silent partner) and Kieran knew that they needed support with some areas where they had less experience, including business management, financial control and marketing. Let It Roll has set itself some challenging start up targets including 160 coffees weekly for the café and 300 record sales weekly. To help achieve this mission they have sublet to a “pop-up” café/coffee bar to be run professionally. They are working hard to achieve their targets in record sales and have been improving the shop interiors before embarking on promotion and advertising of the business. In a short time they have already been able to achieve a good local reputation and loyal customers. “We attended the Enterprise Steps PR Workshop and our adviser encouraged us to put into action ideas from this workshop together with a focus on our website, social media and local press coverage.” says Janet. 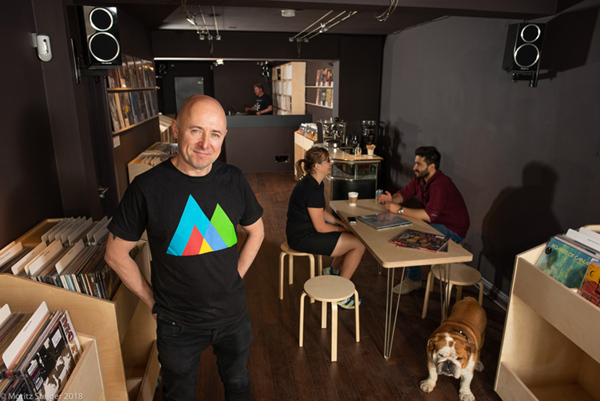 The business duo have felt that they have benefited from having a friendly mentor with whom they have been able to bounce ideas, helping them to develop the café/coffee bar, create events and to hire an experienced record buyer. The Enterprise Steps programme is part-funded by the European Regional Development Fund (ERDF). Find out more about the programme here, and our latest workshops and events here.